Learn about the latest advances and updates from Worldwide Security Group. Our goal is provide you with the most up to date security information. Having serviced customers in the south since the 1990’s, with growing traction Worldwide Security has formally opened it’s Florida office and setup a local team there! We look forward to providing security to more new customers there and increase our US footprint. We are very excited to present our new product, the Worldwide Doorman! The Worldwide Doorman is a convenient solution for your building safety, without the cost of an actual doorman. Increase the value of your property, while enabling your tenants access to numerous premium features. On August 1st 2016, Worldwide Security completed its acquisition of Home Control Systems, Inc., of New Jersey. Home Control Systems is a residential burglary alarm business focused on eastern New Jersey, providing homeowners with security solutions since the mid-nineties. HCS is a natural add, and will be managed and aligned with our business to continue to increase footprint and customer reach. 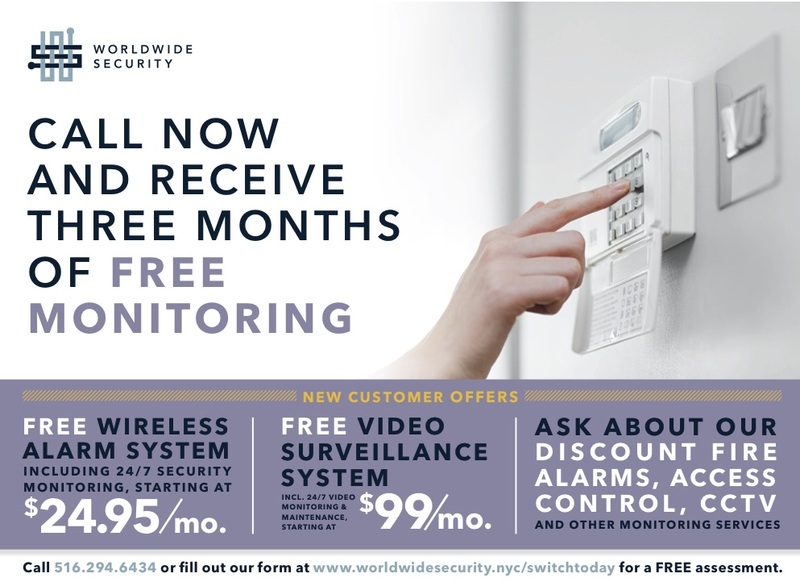 Call 516.294.6434 now and receive three months of free monitoring! On May 1st 2016 Worldwide Security announced the full integration of Dart Security Systems and Rainbow Protection, following the integration of Telestat Security already in April 2016. Together with earlier acquisitions, the companies will form Worldwide Security Group, LLC, located in Manhattan and Long Island. Worldwide Security services and manages one of the largest account bases of security customers in the NYC Metropolitan area, focusing on households, multi-family residential buildings and five star hotels. With increased need for greater than 90 days video storage for our camera surveillance systems customers, we have created a proprietary "Storage as a Service" product line. For many of our key property management customers, "Storage as a Service” secures valuable video and data in the cloud, providing customers instant data access how they want it, when they want it, without the risk of on-premises hardware failures. Sophisticated CCTV cameras provide detailed insights for your building on questions such as who went where, how many people entered area x, how long was that specific object sitting in the lobby, and which people spend what time of day where in the building? Our monthly Data analytics reports program for our CCTV customers has seen the highest number of new customers in the first quarter of 2016. On January 7th 2016, Novidam Capital Partners helped integrate Worldwide Security, GC Alarm, and Vision Monitoring Services. Strengthening the existing management team and ownership, NCP will add value for the long term by focusing on security service customers in the Garden City, Manhattan and Hamptons areas, as well as throughout Long Island. We look forward to continue to service our customers to the fullest and continue to provide more value than our competitors.